Mt. Helix Academy students learn to solve problems and complete projects cooperatively. In keeping with Mt. Helix Academy’s commitment to maximize the academic success of every student, we offer the full range of options for academic assistance. 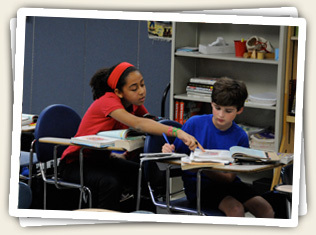 A supervised study hall is available to students in the Primary and Elementary modules from 3:15 to 4:00 p.m. each day. 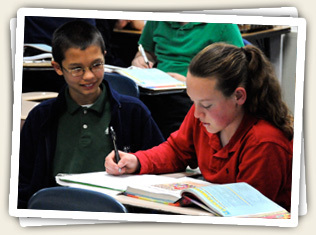 Students are provided a quiet, distraction-free environment in which to complete their homework assignments. Those who need a bit of help find that it is readily available from the study hall monitor. Many parents find the Primary/Elementary Study Hall an invaluable resource, which supports their busy home schedules and reduces the stress sometimes associated with homework completion. social skill that Mt. Helix Academy encourages. A supervised, one-hour study hall, from 3:30 p.m. to 4: 30 p.m. is available to students in Mt. Helix Academy’s Jr. High module. The Jr. High Study Hall is directly supervised by a Jr. High teacher who provides the assistance each student needs to complete assignments. Mt. Helix Academy’s Homework Club is for students who need more supervision and assistance than is available in the after school Study Halls or that can be available at home. Each Homework Club teacher has no more than five students. As a result, each student is provided with the personalized assistance needed to get organized, get started, continue uninterrupted, actually obtain assistance with the assignment, and better comprehend the subject matter. Homework Club is available Monday – Thursday, from 3:15 – 4:15 p.m. but not during holidays or special school events. Homework Club fee is $25 per session and must be purchased for a minimum of two weeks or eight sessions ($200). If Homework Club is purchased for a minimum of six weeks or 24 sessions, the price is $20 per session ($480). In either case, payment must be made in advance to Mt. Helix Academy. Click for Homework Club Sign-Up Form. Students may be picked up after Homework Club ends. Students not picked up by 4:25 p.m., will be sent to the Activity Center for after school child care and must be picked up from the school’s Activity Center. In the event that a student must be absent from Homework Club for other than illness or injury which keeps the student from attending school, twenty-four hours notice must be given or the fee will be charged for the session. Parents can expect periodic reports of their child’s progress in homework club. It is the school’s goal to prepare all students so that Homework Club is not required for success.